Meeting or exceeding our customers defined expectations in all products and service provisions. Supporting all employees and partners endeavors to continuously improve our products, processes and services. 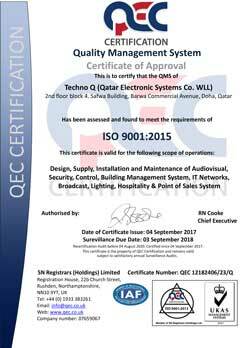 Techno Q obtained ISO 9001:2015 Certification (Quality Management System) in 2017. 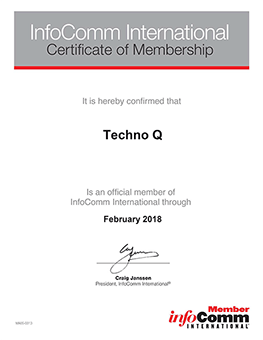 Techno Q was the first system integrator in the Gulf awarded InfoComm International’s Gold Certified Audio Visual Solutions Provider (CAVSP) Status in 2006. Infocomms’s CTS designation is awarded to AV professionals who have demonstrated knowledge and comprehension of the science and technology used in audio, video, display and systems. Techno Q management team drives continual improvement and innovation based upon efficient business processes, well-defined measurements, best practices, observations resulting from audits and customer surveys. We also promote teamwork and use of a common business language (English), terminology and processes. Manages the internal quality audits, initiates follow up audit in order to verify them and records the implementation and effectiveness of the corrective and preventive actions taken. Please contact us with your comments or complaints by e-mail at customerrelations@technoq.com or by calling +974 4000 9700. Our Customer Relations Officer will contact you within 24 hours.